There is a small, dimly lit room on the thirteenth floor of the Institute for Computational Biomedicine at Cornell’s Weill Medical Center. It has no windows, and a soot black velvet curtain hangs heavily along most of its length, broken only by an even smaller recessed space. “Please remove your shoes,” chemical engineer and Cooper Union graduate Jason Banfelder requests, upon entering the room. “And anything metallic,” adds Vanessa Borcherding, who sits behind a counter where a set of 3D glasses is neatly lined up. These aren’t security measures—they are, in fact, measures put in place to protect the recessed space, whose floor, ceiling and walls are actually delicate screens. This is the 3D high definition CAVE, a room-sized computer generated virtual environment that allows researchers to immerse themselves in startlingly life-like three dimensional simulations of different biological systems, ranging in size from the cellular to the organic. The team at the Institute for Computational Biomedicine (ICB) has used such highly advanced technology to create an intuitive experience that is so close to how the human mind experiences things in space and time that the technology becomes, for all intents and purposes, invisible. Instead of reading a 2D scan, report or computer screen, people can now move in and around what feels like a landscape, whether it is the almost lunar panorama of a human retina, the unevenly developed brain of a crack addict’s child, or into a cell to see how proteins move. The CAVE (an acronym for Cave Automatic Virtual Environment) is being used to explore everything from sleep apnea to cancer. Interestingly, the key to the success of the ICB is its interdisciplinary approach and team, which includes biologists, chemical engineers, physicists, applied mathematicians and statisticians. To keep it truly interdisciplinary, each member of the institute must also have an affiliation with another department. Dr. Harel Weinstein, now chair of the ICB and the physiology department, was recruited to Cornell from Mount Sinai in 2004; starting the ICB was part of his recruitment package. He immediately hired Banfelder, who had been his intern at Mount Sinai. Banfelder’s inclusion was key as he had experience that put him squarely at the juncture of two trajectories that were happening in science at the time.“One thing happening in science was—and is—the explosion of data. You’ve heard of the Human Genome Project,” Banfelder says. “In the last four years, high-throughput DNA sequencing has progressed. The Human Genome Project was very slow.”His eyes light up, as he explains, “well, with the equipment we have here, we could probably now do that amount of sequencing in a day or two.” The second factor that triggered the creation of the ICB was the enormous progress in imaging applications. For example, making movies of living cells in action was now a possibility. “A few institutions saw this coming,” continues Banfelder, “and realized that computational work and the ability to handle large data sets was going to become incredibly important.” Cornell was one of those institutions, and was one of the first in the United States to have an institute like the ICB. Banfelder’s charge at the ICB is to figure out how to build high performance computers for analysis of data and to create big storage for these large data sets. In other words, he was tasked with creating super computers, which would help run things like the 3D CAVE. The CAVE alone is run on a room full of computers, which Banfelder has built. The experience itself is astonishing.With a move of the wand, Banfelder sweeps us from a 2D scan into a 3D world. In the case of the crack addict’s child, for example, we move from viewing the boy’s head from the outside, and then are pulled inwards. The flesh evaporates, and the skull appears. The skull, at first bone-white, then becomes like gauze, exposing the brain beneath. We pass through the gauze-like bone, and from there, navigate various cavities until we arrive at a part of the brain that appears to be stunted. Basically, this allows researchers to identify that a patient is a crack-baby before associated behaviors like ADD or disruptiveness appear. This is very important because it means that those behavioral repercussions can be compensated for through behavioral therapies, which will provide the child with tools for adapting to situations which he or she might not have been able to deal with appropriately before. The idea of being able to see space and time as elements of research is apparent in a project in collaboration with researchers at Cooper Union, which looks at the computational model of a nasal airway of a sufferer of sleep apnea. Here, the viewer slides through the nasal passageway, almost as if in a water ride at a fun park, sometimes bumping into the tissue of the wall of the nose, but generally plunging downwards towards the outside world, visible through the nostril. The fact that the left-hand passageway is much narrower than that on the right straight away suggests where the problem might be. But, even more information can be derived from the particles of air drifting upwards, visible as tiny, red dots. A researcher can deduce the velocity of the particles, but also can examine the density and pressure of the airflow process. His education at Hunter College High School and then at the Albert Nerken School of Engineering at Cooper Union provided the framework for his future career in several ways. One of his professors at Cooper, Irv Brazinsky, taught him how to think about engineering—in fact, Banfelder feels that Brazinky has influenced him continuously since then. After receiving his BE in 1993, Banfelder went on to receive his ME in Chemical Engineering at Cooper, working with Dr. George Sidebotham. 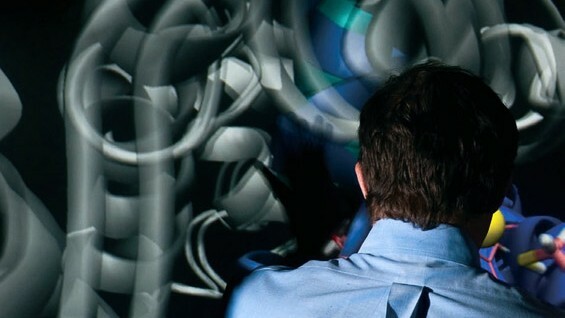 After graduating from Cooper Union, Banfelder wanted to use his degree in chemical engineering. He would have liked to teach, but thought that he wouldn’t be able to work in academia without a PhD. Over the next ten years, he worked in the corporate world. At ABB Simcon, he made simulators for chemical plants and refineries. After five years there, he left to start his own company, Kesler Engineering, where he was the Chief Technology Officer. “I really loved working there,” he says, “but when Dr. Weinstein got recruited to the department here at Cornell, I was happy to come on board.”He has been teaching for the past few years, and last year, he got an appointment at Cornell as an Assistant Professor. So, after all, even without a PhD, he is now enjoying teaching. Currently, he and his team are working on a number of projects.One is to create the computer simulation of a study done in collaboration with the genetics department, which compared active genes in smokers who don’t have cancer, smokers who do have cancer and non-smokers, to see if pathways among the genes were different. Banfelder also just got his first major National Institutes for Health (NIH) grant, for a half million dollars, to use new technology to build a new computational system for the Institute. 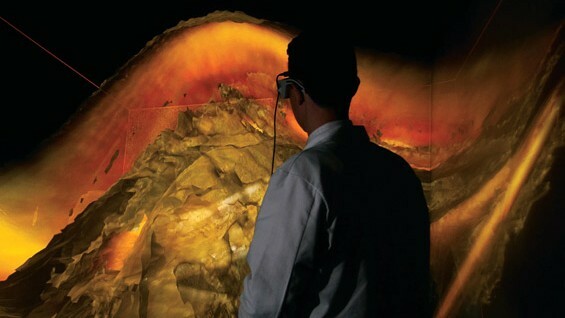 The 3D CAVE can be found at the Cofrin Center for Biomedical Information of the HRH Prince Alwaleed Bin Talal Bin Abdulaziz Alsaud Institute for Computational Biomedicine at the Weill Medical College of Cornell University in New York City.